Stock status is current as of 4/24/2019 2:27 AMET. Prevent your relay rack from becoming an unmanageable web of wires with the 2U Horizontal Cable Management Panel from Cables To Go. 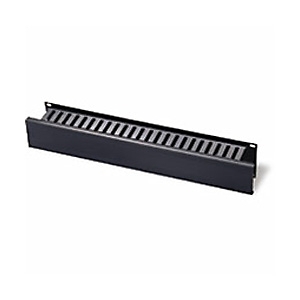 This 2u (3.5in) high panel fits into any standard 19 inch rack and provides a trough in which excess cable can be stored. Patch cords can be easily coiled and placed inside the panel, and the connector can be threaded through the flexible plastic "fingers" to patch panels or network electronics installed above or below. Keep your rack neat with cable management products from Cables To Go.